Wenger SwissGear Pegasus GA-7306-06F00 17" Computer Backpack for 17.3" Laptops. With its inherent strength, durability and comfort, the Swissgear Pegasus is the perfect backpack for anyone with a large load to carry. With space for a 17 laptop plus files, chargers, cables and all your travel essentials, the Swissgear Pegasus offers a considerable amount of storage yet its clever design gives great comfort and fit, even when fully packed. Keeping your laptop safe is a priority for any good laptop bag and the Swissgear Pegasus is no exception. 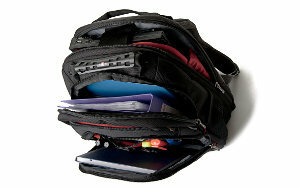 It features a padded computer pocket that fastens with a Velcro strap to keep your laptop safe and secure. Alongside the computer pocket sits an additional compartment for storing your mouse and leads. The Swissgear Pegasus provides a range of features that will add comfort and convenience to your journey. A stabilising platform in the base keeps the backpack upright ensuring that your laptop and other belongings stay securely in place. However, the base can be tucked up when not needed, making the overall size more compact. And whilst it can hold an impressive amount of gear, the Swissgear Pegasus complies with most airline size restrictions for hand luggage. * At the rear of the backpack youll find a useful hanging handle that doubles as a trolley strap. With the Swissgear Pegasus, youll never have a problem finding a particular item. The wide range of different pockets provides a place for everything. There are compartments large enough for carrying A4 folders whilst the essentials organiser at the front includes a selection of small pockets for all those essential items such as mobile phones and keys whilst the side mesh pockets provide even more storage options. A particularly useful compartment is the Swissgear Pegasuss Quick Pocket. Located towards the top of the backpack, this pocket gives you easy access to the items that you need to keep close to hand and includes a handy music pocket specially designed to carry your iPod or MP3 player.